Feel like a fancy drink but not keen on getting boozy? No worries. Allow us to introduce you to the Doozy Hughesy named in honour of Remedy lover Dave Hughes! Read on for our instructions to recreate it yourself at home. 100ml Remedy Kombucha – we recommend Original, but any flavour will work its own magic! Just because you're avoiding booze doesn't mean you have to miss out on the fun when it comes to fancy drinks, right? 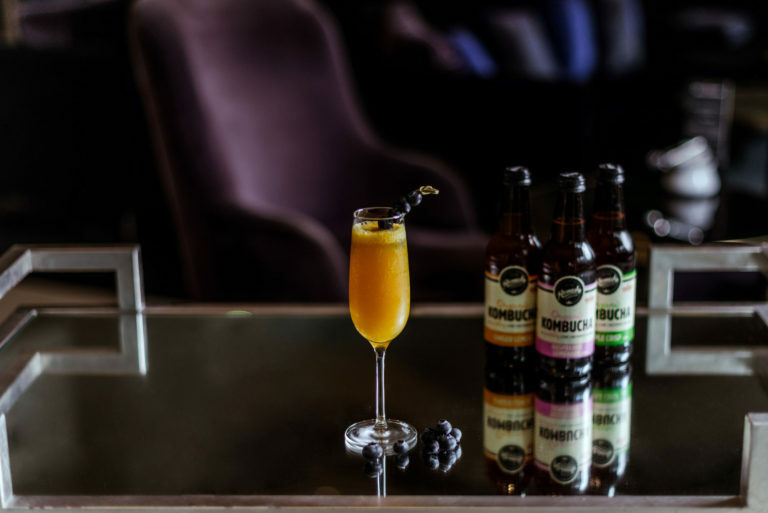 Whether you're feb-fasting for a short time, prefer to avoid alcohol altogether, or just feel like enjoying a booze-free bevvie, we reckon a kombucha mocktail is the perfect remedy (see what we did there?). 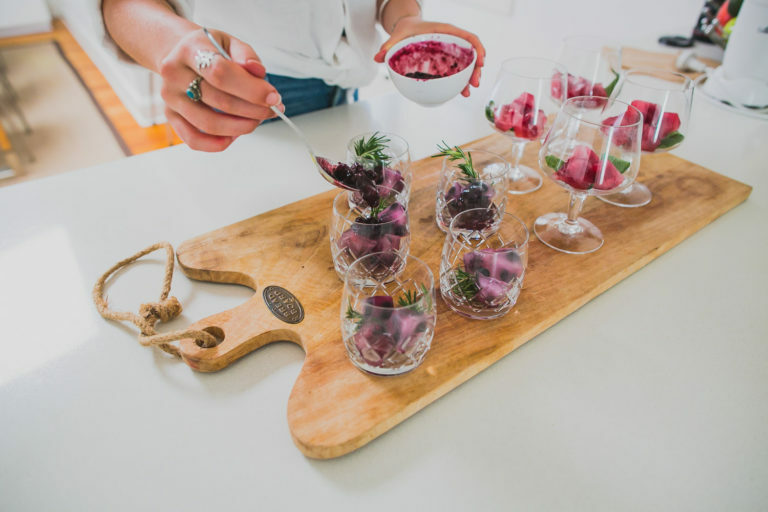 This lovely concoction - adapted from a recipe by The Core Health - ups the fancy factor big time by featuring flavoured ice cubes and a homemade compote. We guarantee you won't feel like you're missing out one bit. Make ice cubes by place 2-3 lavender leaves and 2-3 blueberries in the holes of an empty ice cube tray, cover with filtered water and place in the freezer to set over night. To make the blueberry compote combine 1.5 cups of frozen or fresh blueberries with all other ingredients into a small saucepan over a simmering heat. Once the berries have been cooked through and stewed for around 5-6 minutes remove from the heat and mash with a fork, allow to cool slightly before stirring in the chia seeds, sit. To assemble, add in the ice cubes, a few fresh blueberries plus a lashing of the compote, your spirit of choosing, then top with Remedy Kombucha. Recipe and images by Samantha Flook, The Core Health. One of the perks of having the lovely Jacqueline Alwill from The Brown Paper Bag on board as our Remedy Nutritionist is an inside line to her AH-FREAKIN-MAZING whole food recipes. We were obviously beyond excited when she was inspired by the launch of our new Cherry Plum kombucha to create a delicious, refined-sugar-free sweet treat that celebrates cherry in all its glory. 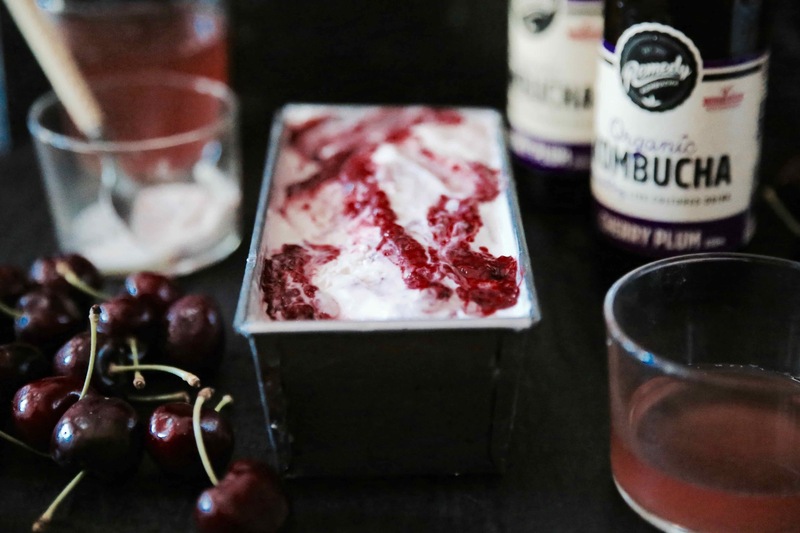 "Remedy’s Cherry Plum Kombucha is deliciously sweet without being too much so, and on these hot summer days the perfect accompaniment for an icy treat – enter ROAST CHERRY RIPPLE SEMI FREDDO – enjoy!" Preheat oven to 180C and line a baking tray with greaseproof paper. Place cherries on tray, drizzle with 2 tablespoons honey and place in oven to cook for 30 minutes. Once cherries are cooked, remove from oven and allow to cool. Make the ice cream by placing greek yoghurt, ricotta, full cream milk, honey and vanilla in a large mixing bowl and whisk together well. Pour half the ice cream into a 1L container, swirl through half the cherries and repeat. Wrap with glad wrap and place in freezer to set over night. Remove and allow to thaw slightly before serving. To serve either flip out of tin and slice or scoop and serve with roast stone fruit. Banner image by Jacqueline Alwill for The Brown Paper Bag. Let's be real. Many of us don't mind a tipple or two, especially at the end of a long week. We figure if you're going to be enjoying some booze, you may as well go all out and make it a quality drink. 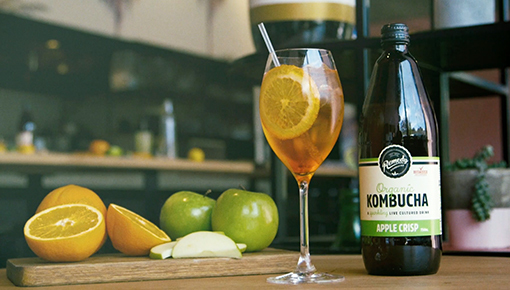 Enter our Remedy Kombucha cocktail recipes: a little naughty and a whole lotta nice. To kick things off, we've got an Italian classic with a twist: the Remedy Aperol Spritz. Keep on scrollin' for the full recipe. Props to Leroy from Lulu White for the recipe! We all know that the days of professional footy players cracking open a beer in the change rooms straight after every game are long gone. But did you know that many players are now cracking open a kombucha? That's right, some of your favourite footy players are also some of Remedy's biggest fans, thanks to the benefits it provides for natural energy, gut health, recovery, and overall wellbeing. This year, Remedy Kombucha is proud to be an official partner of the North Melbourne Football Club, keeping their club room fridge stocked to the brim with our delicious, healthy, I Quit Sugar approved kombucha. Pictured above L-R: North Melbourne Vice-Captain, Robbie Tarrant; Collingwood AFLW Marquee Player, Moana Hope; North Melbourne player, Luke McDonald. It's not just the boys getting in on the kombucha craze. We are also a proud official supporter of AFL Womens star, Moana Hope, who appreciates Remedy for its goodness but also tells us she just loves the taste! We love Mo's approach and attitude. It's somehow both real and relatable and inspirational all at once. She is all about showing that that footy is for everyone, and we're stoked to have her on board to help spread the message that kombucha is for everyone too. 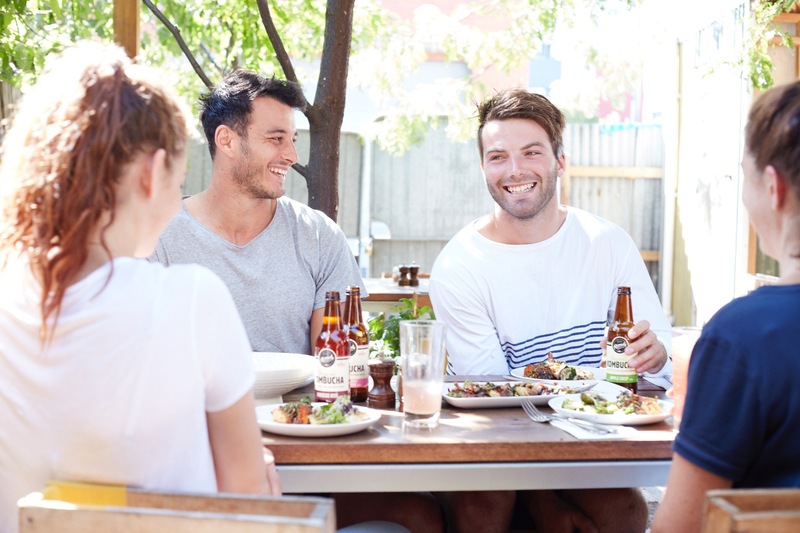 So what is about kombucha that has footy clubs and their players so excited? Rather banging on about it more ourselves, we asked a couple of AFL experts on football player health and wellbeing. Jona Segal, Dietitian and Strength & Conditioning Coach North Melbourne Football Club says Remedy Kombucha is part of North Melbourne's holistic approach to improving their players general health and wellbeing through diet and an increasing focus on gut health. "The fact that Remedy naturally contains no sugar was really important. It’s increasingly clear that even if you can burn off sugar, too much of it can have other negative health impacts," says Jona. "I also believe kombucha is an excellent addition to our players’ diets because it contains live cultures and organic acids that can aid digestion and help the body absorb minerals. "Remedy is also a great source of antioxidants and has excellent anti-inflammatory properties." Thanks guys. We love ya guts!